Dean’s Dish – 5th Blog Edition and FIRST EDITION of the 13-14 Academic Year! Cabrillo Gallery opens Sight Insight tomorrow night! Please join the Cabrillo Gallery, on Thursday September 12, 5:50-7:00 p.m., for the opening reception of Sight Insight: Cabrillo Art & Photography Department Staff & Faculty Exhibition. The exhibition continues through Friday, September 27, 2013. A free panel discussion of select artists will be held in the gallery on Tuesday, September 17th at 7:00 p.m. Sight Insight, a survey group exhibition, brings together the artwork made by the many very talented individuals of the Art, Art History, and Art Photography programs at Cabrillo College. More than 35 artists will participate and include Brian Legakis – Art History, Susan Hoisington – Art Photography, Dawn Nakanishi – Small metals, Sylvia Rios – Ceramics, Victoria May – Artists’ Books, Angela Gleason – 3-D Design, Rose Sellery – Cabrillo Gallery, Tobin Keller – Screen Printing. An open invitation to area artists to exhibit at Cabrillo! 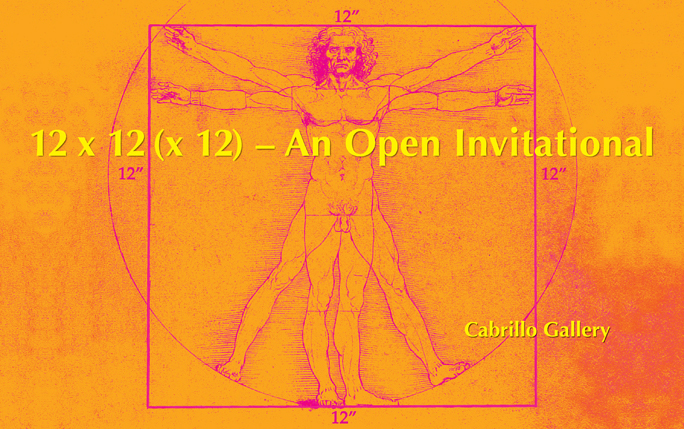 The Cabrillo Gallery seeks entries for 12×12(x12): An Open Invitational. All entries will be accepted providing they are exactly 12”x12” (by a maximum of 12” deep) and are ready to hang on the wall. Open to California residents. Enjoy Sir Ken Robinson’s engaging TED talk on the centrality of the arts in education!